Much of what is understood about immune surveillance of cancer has come from comparing susceptibility to transplantable or carcinogen-induced cancer models in normal versus various immuno-compromised strains of mice. 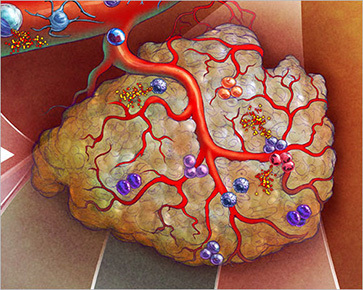 We have overcome many of the obstacles of transplantable and carcinogen-induced models of cancer by generating autochthonous, genetically engineered mouse models (GEMMs) of cancer that can be induced to express or lack model tumor-specific neo-antigens (TSAs) to investigate the consequences of immune-tumor interactions in the pathophysiology of distinct forms of cancer. To do this we created multi-functional lentiviral vectors that allowed for the induction of next-generation GEM tumor models that express neo-antigens. The use of lentiviruses has been a technological advancement essential for many discoveries in the field because it provided a new paradigm for rapidly introducing key cDNAs, shRNAs, or CRISPR/Cas9 into multiple autochthonous cancer models. By using these models, we have already made two key discoveries for the field of cancer immunoediting – the process by which immune cells protect the host from the development of cancer or drive the outgrowth of tumor cells with decreased sensitivity to immune attack. First, oncogene-driven, autochthonous sarcomas undergo immunoediting in a manner similar to carcinogen-driven tumors if they express model TSAs. Immunoediting occurs via loss of TSA or MHCI expression. Second, sarcomas induced without potent TSAs are significantly less immunogenic, even when they develop in the absence of the adaptive immune system. Therefore, my work revealed that recognition of TSAs by lymphocytes is a critical determinant of immunoediting and that tumor immunogenicity is not a universal characteristic of all cancers. Our work has been transformative because it provided the first experimental system to unify the apparently conflicting results obtained using either carcinogen-induced or genetically engineered mouse models of cancer by identifying TSAs as the critical determinants that invoke adaptive immunosurveillance and immunoediting. Most importantly, it revealed that TSAs are critical for driving the most effective immune responses to cancer and this has proven to be the case in cancer patients who respond best to immunotherapy if they harbor TSAs that can be recognized by T cells. Going forward, we aim to compare T cell responses to a variety of cancers that arise in different tissues or with differing genetic drivers to determine how differing microenvironmental contexts shape immune responses. For example, we have already discovered that, despite having the same underlying genetic driving events, sarcomas and lung cancers engage the immune system and respond quite differently. Endogenous T cell responses to lung tumors are less productive and are incapable of driving antigen loss. We also aim to develop next generation models of cancer to better mimic interactions of immune cells and tumor cells in these sophisticatd models of cancer. Cheung AF, DuPage M, Dong HK, Chen J, Jacks T. Regulated expression of a tumor-associated antigen reveals multiple levels of T-cell tolerance in a mouse model of lung cancer. Cancer Res. (2008) 68:9459-68. DuPage M, Dooley AL, Jacks T. Conditional mouse lung cancer models using adenoviral or lentiviral delivery of Cre recombinase. Nat Protoc. (2009) 4: 1064-72. DuPage M, CheungAF, Mazumdar C, WinslowMM, Bronson R, Schmidt LM, CrowleyD, ChenJ, Jacks T. Endogenous T cell responses to antigens expressed in lung adenocarcinomas delay malignant tumor progression. Cancer Cell (2011) 19: 72-85. Winslow MM, Dayton TL, Verhaak R, Kim-Kiselak C, Snyder EL, Feldser DM, Hubbard D, DuPage M, Whittaker CA, Hoersch S, Yoon S, Crowley D, Bronson RT, Chiang DY, Meyerson M, Jacks T. Suppression of lung adenocarcinoma progression by Nkx2-1. Nature (2011) 473: 101-104. DuPage M, Mazumdar C, Schmidt LM, Cheung AF, Jacks T. Expression of tumour-specific antigens underlies cancer immunoediting. Nature (2012) 482: 405. DuPage M, Jacks T. Genetically engineered mouse models of cancer reveal new insights about the antitumor immune response. Curr Opin Immunol. (2013) 25:192-9. Joshi NS, Akama-Garren EH, Lu Y, Lee DY, Chang GP, Li A, DuPage M, Tammela T, Kerper NR, Farago AF, Robbins R, Crowley DM, Bronson RT, Jacks T. Regulatory T cells in tumor-associated tertiary lymphoid structures suppress anti-tumor T cell responses. Immunity (2015) 43: 579-590.